The official Prometheus Twitter page has posted a new screenshot of the RT101 transport vehicle. In connected news, another user on Twitter posted unofficial set pictures of the vehicle yesterday too. “Old School Scifi” for Prometheus. Can't wait to see it get totaled! Bonus points if they "blow a trans-axle". Edit-- also these labels are hilarious. "Bio-nomic telecom unit"? "Satellite-linked maintenance"? What does that even MEAN? Nod to Star Wars: "Horizontal boosters...! Alluvial dampers...! Well that's not it. Bring me the hydrospanners!" So shiny! I'm digging the production design on this film too; that clean, pulp sci-fi spaceman look. Look at that sky! LV-223 looks nice this time of year. Ignoring all the desolation and murderbeasts, of course. 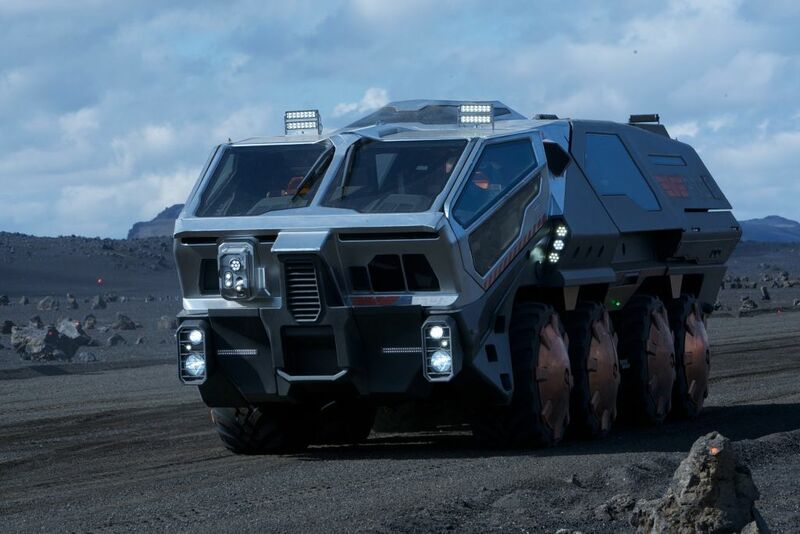 Since the principal photography for 'Prometheus' is long over, does this vehicle still exist? ...or did it go the way of the custom cars built for 'Blade Runner'? I really like the ships and vehicles in the movie . Why are they parked at Shepperton, when Prometheus was filmed at Pinewood? Doesn't Scott own the Shepperton studios? Haven't Shepperton and Pinewood merged? The Rank Group owned the studio until 1995, when they sold Pinewood to a group led by Michael Grade and Ivan Dunleavy. The purchase of Shepperton Studios from a consortium headed by Ridley and Tony Scott gave rise to The Pinewood Studios Group with both UK and international interests including Shepperton Studios, Teddington Studios, Pinewood Toronto Studios, Pinewood Indomina Studios, Pinewood Studio Berlin and Pinewood Iskandar Malaysia Studios, combining three studios steeped in heritage and prestige as well as new and modern state-of-the-art purpose built facilities. The RT01 Transport is a great nod to the APC from Aliens...except the RT01 looks so much cooler. This sort of reminds me of my father's old Volkswagen Transporter from the 1970's. The older designs back then were so much better than the bland, uninspiring models that came out in later even though you'd expect the designs in general to get better with time. I guess the general rule that "classic cars always look better than the new stuff" applies in the universe that Alien exists in as well. I'm glad Ridley is applying real world sentiments about that sort of stuff in Prometheus...it makes it all feel so much more real.